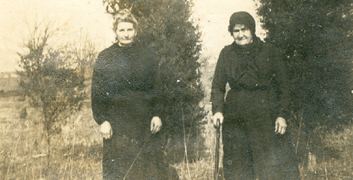 Martha Jane "Mattie" (Harbaugh) Laughery was born on May 24, 1865 on a farm at what is now Clairton Lake near Scullton, Somerset County, PA, the daughter of David and Mary Magdalene (Whipkey) Harbaugh. On Nov. 21, 1889, when she was 24, Mattie married a second cousin, David Leander "Andy" Laughery (1858-1927) (pronounced "loff-ree"). He was the son of Daniel and Cathran Ann (Harbaugh) Laughery of Dunbar, Fayette County, PA, and the grandson of David and Anna (Wilson) Harbaugh, also of Dunbar. 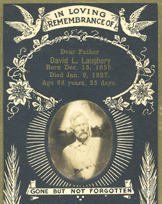 David's father had served with the 14th Pennsylvania Cavalry in the Civil War and died while in the service at Camp Schoonmaker, Hagerstown, MD. David was seven years older than Mattie. The Connellsville Courier reported the news of their marriage license, and said both were residents of Dunbar Township at the time. The Laugherys went on to have seven children -- Kathleen Martin, Mary Lou Laughery, Leona Wilkerson, Ira Hubert Laughery, Arthur Davis Laughery, Anna May Thompson and Willis Harbaugh Laughery. 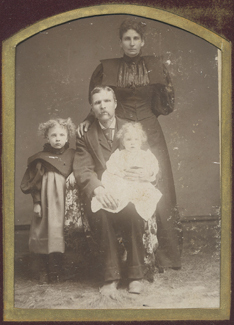 Mattie and David are seen at right with their daughters Kathleen and Leona. Sadly, daughter Mary Lou (-1894-) died at the tender age of three days, on July 15, 1894. For many decades her grave was not marked. In about 1999, more than 100 years after her death, her nieces and nephews involved with the Laughery Reunion made an effort to have a marker placed at her final resting spot. Sometime in the early 1900s, after the birth of her daughter Anna May, Mattie arranged for her talented cousin, Allen Edward Harbaugh ("The Mountain Poet") to inscribe the Laughery family Bible with their names and birthdates. Using his unique style of calligraphy, Allen printed each name in all capital letters using black ink, with the letters decorated with swirls and swooshes in bright red and blue inks. The Bible page (seen here) became a treasured family heirloom and today is preserved lovingly by a granddaughter. David was appointed postmaster at Vanderbilt, Fayette County, sometime in the 1890s, and served for a total of 16 years. When the federal census was taken in 1900, the Laugherys made their home in Dunbar, Fayette County, where David lived while serving as Vanderbilt postmaster. Boarding in their home that year was David's unmarried uncle, 51-year-old farm laborer Samuel Wesley Harbaugh. Heartache struck David's world in mid-September 1901 when thieves broke into the safe of the S.E. Porter drug store in Vanderbilt, taking $300 in post office money, checks and postage stamps. Reported the Connellsville Courier, "Most of this money and the stamps belonged to the Vanderbilt postoffice. Postmaster D.L. Laughrey was in the habit of placing his receipts in Porter's safe over night. 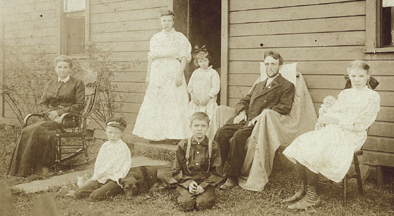 No clew [sic] has been obtained to the robbers..."
Laugherys at their home in Vanderbilt, PA, circa 1909 -- L-R: Martha, Arthur, Cathleen, Ira, Anna May, Uncle Sam Wilson and Leona holding baby Willis. David appointed his niece, Nellie Laughery of Scottdale, Fayette County, as assistant postmaster in March 1904, succeeding Orville G. Parkhill, who resigned to become a bookkeeper for a local contractor. The Laugherys moved to Vanderbilt, Fayette County during the years between 1900 and 1910. The federal census of 1910 shows the family there, making its residence on Plumb Alley. David's nickname, as used by the census-taker, was "Andy," short for "Leander." By that year, Martha and David had been married for 20-plus years, and had produced six children. 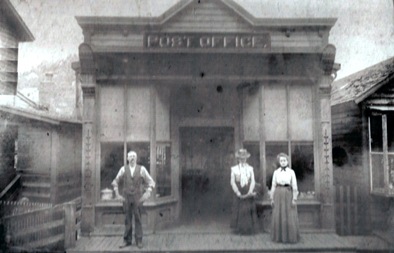 According to the Harbaugh History, David was postmaster of the town for many years, as confirmed by the census of 1910. Research is underway to determine if his application papers for the government position exist today in the National Archives or elsewhere. The Connellsville Courier newspapers of the late 1890s and early 1900s contain many brief gossip items about David's comings and goings, as he was a public figure. He went to Somerset County "on a vacation" in October 1898, said the Courier. "He is busy gathering chestnuts and hunting squirrels." In May 1904, the Courier said that David and Dr. Jesse Hazlett had gone to Normalville, Fayette County the previous Saturday, "and spent Sunday in the mountain resort." In March 1906, the Courier reported that David's niece, Nell Laughery (spelled "Laughrey"), had spent the week at the home of David and Martha. "[H]er many friends welcome a visit from her," the Courier said. 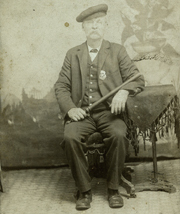 David is seen here, wearing what appears to be a constable's badge on his jacket, and holding what looks to be a nightstick. His work as a constable or justice of the peace is not known, and needs to be researched more fully. Eleven days before Christmas, on Dec. 13, 1910, Mattie's father David Harbaugh died at his home on the old farm near Clairton Lake, Somerset County. The effect of this passing on the Laugherys is not yet known, but in the following year, 1911, Martha and David made a major life decision, and David left the employment of the post office. They migrated eastward to Delaware, in about March 1911, settling on a farm near Farmington, Kent County. Their new residence, as listed on the 1920 federal census, was on Farmington Road in Kent County. Only son Willis, age 10, made his home with them that year. The whereabouts of the other children at that time are not yet known. Reasons for the Laugherys' move so far away from their home and family are not known, and can only be guessed at this point. What is known is that David's elderly uncle, Samuel Wesley Harbaugh, who had lived with the Laugherys in 1900, was boarding in 1910 with John and Josephine Wrigley in Vanderbilt. The aged man left the Wrigley residence and joined the Laugherys on their relocation to Delaware. He died of kidney disease in Greenwood, DE, on May 6, 1911, at the age of 63. His death certificate shows he had only lived in Delaware for two months and six days at the time of death. An obituary in the Uniontown News Standard said that Samuel's "reputation for truthfulness, strict honesty and absolute independence of thought, coupled with a kindly tolerance for the failings of others had made him respected and loved by all who knew him. His unexpected death after a short illness comes as a great shock to his many relatives and friends in Fayette and Westmoreland counties." He was buried in what became the Laughery plot at Hollywood Cemetery in Harrington, DE. Martha and David resided on their farm in Farmington for 16 years, until his death. Suffering from valve problems in his heart, David was hit with a heart attack and passed away at the age of 68 on Jan. 9, 1927, just 25 days after his birthday, ending a marital union of 38 years together. He was buried beside his uncle S.W. Harbaugh at Hollywood Cemetery. His funeral card, bearing his photograph portrait showing a much thinner face, is seen at right. As a widow, Martha outlived her husband by six years. She made her home on the family farm with her youngest son, Willis Harbaugh Laughery, who carried a deep love for his mother's family "back home" in the mountains of Western Pennsylvania. On Dec. 17, 1933, a week before Christmas, Martha died of bronchial pneumonia in Farmington. She was age 68 at the time. Daughter Kathleen Martin, in Connellsville, received the news, and the Connellsville Daily Courier newspaper published a prominent obituary. She was laid to rest beside her beloved husband in the Hollywood Cemetery. The tight-knit group of Laughery children and grandchildren holding an annual family reunion in 1964, on the home farm owned by Willis and Dorothy Laughery. Click to see the family's comprehensive year-by-year reunion archive spanning more than 40 years. The family's 43rd reunion was on Aug. 18, 2007, at the home of Dayna and Rell Winand in West Chester, PA. Officers of the 2007 reunion were president Tim Douglas, vice president Kim Douglas, and secretary/treasurer Ron and Peggy Case. All attendees were asked to bring a side dish or dessert to share. 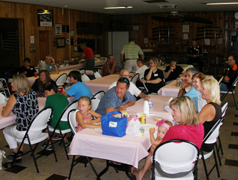 The 2009 reunion was held at Lelia-Hynson Pavilion at Wilmer Park in Chestertown, MD, with Steve Winand serving as president, Janice Winand as vice president and Ron and Peggy Case as secretary/treasurer. 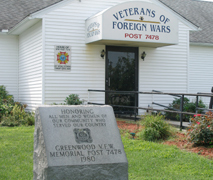 In 2010, the reunion was held at the Veterans of Foreign Wars (VFW) Hall in Greenwood, with Tim Douglas serving as president, and Ron and Peggy Case continuing their longtime role as secretary/treasurer. The founder of this website was privileged to be among the attendees, and was welcomed warmly by the group of cousins. Many new acquaintances were made, and much new information about the family gathered during the day to be included on this website for all to enjoy. View the comprehensive archives of the Laughery Reunions, from 1965 to the present.